Which hard truths do Brits think their friends can&apos;t handle? October 24, 2016, 2:26 p.m.
Our close friends are the people who will stick with us through thick and thin, those whose opinion we value above all others and whom we can tell anything. But are we prepared to? How willing are we to tell our closest friends hard truths about themselves? New YouGov research reveals the extent to which we are prepared to let our close friends know about problems with their appearance, character and relationships. Of a list of 15 hard truths, there were just five that people would be more prepared than not to break to their friends. Telling someone that they give people bad presents is the hard truth the most British people would baulk at – just 16% said they would tell a close friend this, whilst 68% said they would not. Telling someone they are a bad parent is also off the table for most – 21% would break this news to their friend compared to 61% who would not. At the other end of the scale, most people would be prepared to tell their friends they disagree with them on something they feel strongly about (78% vs 12% who would not). They’re also prepared to tell their boozy friends that they drink too much (57%), that they smell bad (51%) and that their partner is cheating on them (50%). Men tend to be much more willing than women to lay hard truths down on their friends, especially with regards to appearance – men are about twice as prepared as women to tell a friend they have a bad haircut (50% vs 27%) or overweight (40% vs 18%). People also become progressively less willing to tell people hard truths as they get older. The most extreme example is in their willingness to tell their friend that their partner is cheating on them – as many as 82% of 18-24 year olds would break this news to a friend, dropping to just 23% among 65+ year olds. 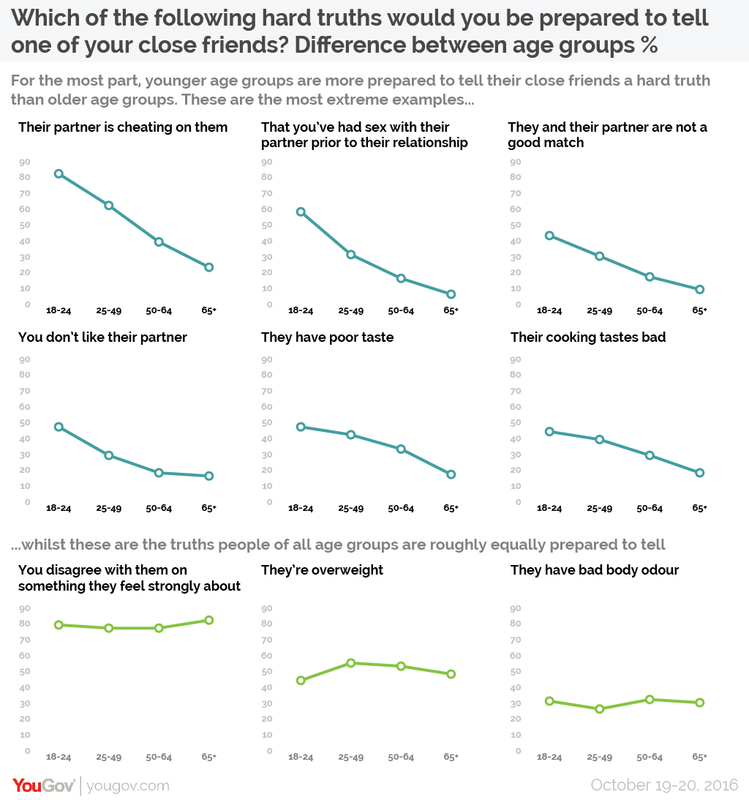 In fact, all the hard truths about partners that we listed top the age divide scale, with British people becoming progressively less likely to say anything negative about a friend’s partner as they get older.